Mars has beckoned us since ancient times. The red orb traveling across the sky, stoking imaginations around the world. Then came the telescope and sightings of shifting dark areas and “canals.” Armadas of robots would reveal a desolate world, once wet and dynamic, laid waste by some cosmic catastrophe. Yet it was writers that kept us looking to the Red Planet. From the epic John Carter adventures, to The Martian Chronicles, to the more recent The Martian, there has been a steady stream of visions of Mars. Now comes J.C.L. Faltot‘s The Road to Mars. Decades from now, Mars has been colonized, but war came between the planets. Earth was left in a ruined state and its people blame Mars. Darion and his daughter Olivia travel through the ruined cities, looking for a way to leave. He believes life on Mars is better, like Earth once was. But there is more. The Darklight is destroying Earth. Shadows lurk in the darkness. What is the Solfire? And do those who lived before the Pulse, know the truths of both worlds? The Road to Mars, part one of a trilogy, begins differently than most Mars novels. Here we are in a dystopian landscape, and a father and daughter fight to survive, somewhat reminiscent of The Road. Elements of Light versus Darkness lurking in the background and simmering under the surface, remind me of Chris Walley‘s The Lamb Among the Stars series. Combined, these create a fresh new story of survival, choice and destiny. Road is a compelling journey with well-realized characters, who don’t all end up quite as one would expect. All this before anyone reaches Mars, so you will be anticipating book two and what lies among the red sands. 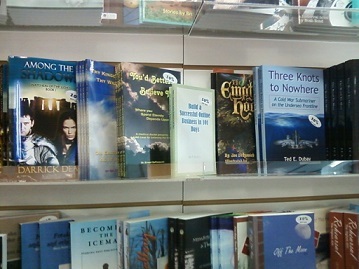 This was at indie bookseller, Leana’s Books. I thought I had something else in the picture, but I guess not: J. C. L. Faltot‘s new The Road to Mars is just visible at the extreme right. To the first of many booksellers!